For the 1994 model year 3,083 Dodge Vipers were produced (the largest production number of any year of the first generation Viper). Compare this to the 2001 model year C5 Corvette Z06 with its 5,073 cars produced and the Viper is certainly the comparably rare car. Beyond this year for year the Z06 sold more units, but is still a lower production model for a Corvette. Both cars have large engines that sitting up front. The Viper has a fire breathing 400 horsepower V10 sending power to the rear wheels. 0-60 mph comes in just 4.5 seconds and the quarter mile can be run in 12.9 seconds. For a car from the mid-90’s these are incredible stats. The 2001 Corvette Z06 has a few more years of development on the Dodge Viper and the V8 sitting in front pumps out 385 horsepower (later years of the C5 Z06 would see this rise to 405). While it has less horsepower than the Viper it uses an aggressive gear ratio and it has slightly less weight to move than the Dodge. 0-60 mph also comes in at 4.5 seconds and the quarter mile can be run in 13 seconds. 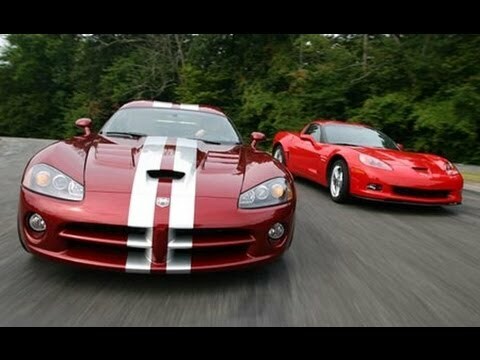 Both cars are very fast and the Corvette is just about as fast as the Viper in a straight line. Handling of either car is less than totally refined. The C5 Z06 handles well for its time, but it still isn’t as refined as something like a Porsche Boxster. The Viper RT/10 can also handle well in the hands of a skill driver. The biggest issue it has is dealing with all that power can quickly cause it to loose control and there are no electric safe guards. Interior quality of both cars is not quite up to their European rivals. The Viper has a simple interior with controls that you will find in other Mopar vehicles of the time. Beyond this there are is no glass in the side windows. Instead you get a top from a Jeep complete with plastic windows. The only door handles are inside the car, but there is a remote door opener. The Viper has little in the way of storage space as it has a small trunk that you have to plan very carefully if you want to take your significant other on a trip. Inside the Z06 feels fairly ordinary as there is a typical Corvette interior. The seats are solid high backs with larger bolsters than the standard C5 (although they could do a better job holding you in place during hard cornering). This is also from the era of ‘Vette that most of the interior is made of plastic straight from a Power Wheels. It still does the job, but doesn’t impress, especially when compared to modern interiors. The Z06 does have a trunk which offers enough storage for a few smaller suitcases. You also have some additional storage space right behind the seats. From an investment perspective, the Dodge Viper is probably the car that will go up in value at a faster rate. The Viper has an iconic shape and was the king of the Mopar lineup since the 90’s until 2017. Production numbers are smaller than the Corvette’s which should also help values. The Viper also looks like a supercar. Since the Corvette Z06 has restrained styling that looks pretty much the same as other C5 Corvettes, it doesn’t stand out. For the probability of one of these shooting up in value this just adds to the Viper’s strengths. However, the Z06 is an important car for Corvette and most collectors will want a C5 Z06 to round out the collection. The later 405 horsepower cars will go up in value first, but the 385 horsepower vehicles should not be far behind. The C5 Z06 also has the added attraction of being easy to live with. It won’t get extra attention, other than from other Corvette enthusiasts, so gas station stops won’t take an hour. It is an easy car to daily drive and for a sports car it offers a good amount of practicality. Maintenance is also fairly inexpensive with it not needing a major service until 100,000 miles. The Viper is not quite as easy to live with. The stock soft top does not prevent those who know where to unzip the window from doing so and opening the door. Maintenance is inexpensive for a supercar, but it costs more to keep on the road when compared to the Corvette. On average maintenance will cost about $1,000 a year if the car is driven about 5,000 miles a year. One item to keep in mind is that the head gasket tends to need to be replaced every 20,000 miles. From a cost stand point currently the 1994 Dodge Viper can be found for $23,000 – $35,000 depending on mileage and condition. The 2001 Corvette Z06 will run you $15,000 – $25,000 likewise depending on mileage and condition. Both are very reasonable when you consider the current prices and the performance you get in return. So, which would you choose? The Dodge Viper puts you in supercar status without the ridiculous maintenance costs of comparable Italian exotics. However, the Corvette Z06 offers nearly the same performance as the Viper in a package that can fly under the radar.